Photos Of Me, originally uploaded by Lukasmummy. Credits: Layered template (I Create Template) by Peppermint Granberg (One Little Bird) and 52 Inspirations 2011 The Basics by Sue Cummings and Vicki Stegall. Font is Century Gothic. Journalling reads: I hate having my photograph taken, it’s hard to smile and pretend that everything is ok when I feel so ill all of the time. I hate when I do let people take photos of me and I look at them and find myself cringing at how awful I think I look. But there are rare occasions when I let people take photographs of me and I actually don’t mind the result. I think sometimes the camera lies but in a good way. When my family looks back at these photos maybe they will forget that these moments were few and far between, maybe they will think that since the photos show me looking fairly happy and healthy that’s the way it must have been. I would much rather they remembered these moments than the sick ones. Enabling: I Create Template by One Little Bird available here, 52 Inspirations is a subscription based product by Vicki Stegall and Sue Cummings available exclusively at Oscraps here but if you want to pick up just the 52 Inspirations 2011 The Basics you can do that here. 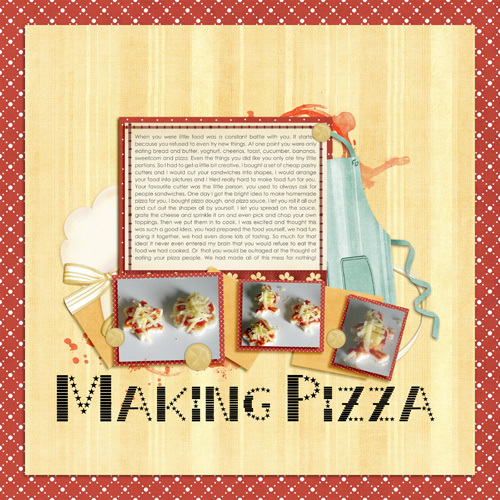 Making Pizza, originally uploaded by Lukasmummy. Credits: Layered template (Flight Plan 4) slightly altered by Peppermint Granberg (One Little Bird) and In The Kitchen Basics by Karen Schulz (Snickerdoodle Designs By Karen) and Jewel Goodwin (Mad Genius Designs). Fonts are Century Gothic and Stripes and Stars. Journalling reads: When you were little food was a constant battle with you. It started because you refused to even try new things. At one point you were only eating bread and butter, yoghurt, cheerios, toast, cucumber, bananas, sweetcorn and pizza. Even the things you did like you only ate tiny little portions. So I had to get a little bit creative. I bought a set of cheap pastry cutters and I would cut your sandwiches into shapes. I would arrange your food into pictures and I tried really hard to make food fun for you. Your favourite cutter was the little person, you used to always ask for people sandwiches. One day I got the bright idea to make homemade pizza for you, I bought pizza dough, and pizza sauce, I let you roll it all out and cut out the shapes all by yourself. I let you spread on the sauce, grate the cheese and sprinkle it on and even pick and chop your own toppings. Then we put them in to cook. I was excited and thought this was such a good idea, you had prepared the food yourself, we had fun doing it together, we had even done lots of tasting. So much for that idea! It never even entered my brain that you would refuse to eat the food we had cooked. Or that you would be outraged at the thought of eating your pizza people. We had made all of this mess for nothing! Im So Bored, originally uploaded by Lukasmummy. 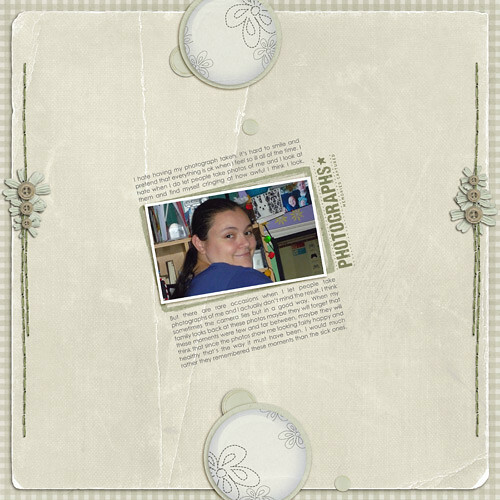 Credits: Layered template (Flight Plan 1) by Peppermint Granberg (One Little Bird), Edge Genius Volume 1 by Jewel Goodwin (Mad Genius Designs) and Just Another Day (slightly recoloured) by Jen C Designs. Font is DJB Constance Beauregarde by Darcy Baldwin. Journalling reads: When we took you to Jamboray for your birthday, we were expecting to be there a while. What we hadn’t expected was how boring sitting there for hour after hour was. Daddy amused himself playing games on his phone and playing the Nintendo DS, he’s easily frustrated when he’s bored. I mostly tried to run around behind you snapping picture after picture, and doing crazy things like going down the slide with you. Eventually I was too worn out to play anymore, so I went and sat on the sofas with Daddy. kicked off my shoes and sat back to relax. I usually don’t get bored, because I am always doing something. The first thing I tried was sketching out some page designs for layouts, after that I tried organising some things on my phone, before giving in and playing your Nintendo DS. I was really mad with myself because it felt like such a huge waste of time and it was making my hands really hurt. Lesson learnt next time I am taking a magazine to read! or better still, the laptop so I can scrap while you play!